Like any respectable game system of the 90's, Game Gear had its own version of NBA Jam. The graphics have that colorful arcade flair with well-defined players that effortlessly glide through the air to perform rim-rattling dunks. But wait a minute - why does John Stockton have blonde hair? Your goal is to defeat all the teams in the league beginning with the Dallas Mavericks. A 14-character password system is used to record your progress, so keep a pen handy. As you'd expect for a portable translation, certain liberties were taken. Instead of a proper turbo button, the start button is used to give your player a burst of speed. It works but is definitely awkward. I wish the button configuration had the shoot button closer to the turbo. The action on the court is non-stop but not as tight as the console versions. The passes are slow and the CPU takes advantage of this to steal the ball. I noticed if you harass the CPU enough in the backcourt he'll sometimes settle for an ill-advised long-range three. Sadly, a surprising number of those shots go in! There's no live commentary and I wish there was a way to shut that looping music off. Despite its deficiencies NBA Jam does a nice job of capturing the spirit of the arcade game. When you're down by a bucket with those final seconds ticking down, the excitement level is high. Even a sub-par version of NBA Jam is a heck of a lot of fun. © Copyright 2015 The Video Game Critic. I had a good time with the first NBA Jam for the Game Gear, and Tournament Edition takes the high-flying, slam-dunking action to a whole new level. Unfortunately, you're forced to sit through an inordinate number of intro screens featuring various logos and disclaimers. There are no less than seven unskippable screens, and on a portable system that's unforgivable. The object is still to defeat all the teams with the league (worst to best) and the password is shorter this time around. The players on the court look more detailed and their shoes glow while turbo is engaged. I like the cheerleaders on the sidelines, but the crowd looks more like a sea of blue grocery bags. WTF? The CPU opponent is a lot more aggressive - at least on the default level. It seems like whenever you steal the ball he immediately steals it back! On the flip side, making three-pointers is a lot easier - too easy in my opinion. Tournament Edition also boasts a much-needed options menu. Among other things you can activate "tag" mode, select from five skill levels, and disable the worthless "CPU assistance". The buttons can be configured however you like, but frankly I struggled to find a comfortable set-up. An extra menu lets you add more razzle dazzle in the form of icons and power-ups. And if you really want to see how fast a portable game can be, activate the frantic "juice mode". It's nuts! Considering the wealth of options it's a shame you can't disable the frenzied music, which sounds like a xylophone experiencing turbulence. All things considered, NBA Jam Tournament Edition is undeniably fun and the customization options really boost the replay value. © Copyright 2015 The Video Game Critic. If not for its obvious technical flaws, QB Club would be a nice little football game. It certainly scores highly in terms of presentation. The side-scrolling field looks sharp, and the pudgy players are easy to follow. A smart control scheme lets you spin or speed burst when running with the ball, and this is one of those rare football games where you really can break away from the pack for a long run. Passing requires precise timing because throws tend to float in the air. On defense, you should be able to switch to the closest defender at any time, but most of the time this doesn't seem to work. The play calling screens are attractive and easy to navigate, and even contain trick plays like reverses, shovel-passes, and half-back options (yes!). All the NFL teams are available (circa 1994), and you can play a password-saved season. Unfortunately, the CPU opponent is weak, even on the "pro" level. That's a serious problem considering there's no link capability. Other issues include players that disappear from the waist down, and sometimes disappear completely! The ball moves at an angle instead of an arc, which indicates lazy programming. After an incomplete pass, you have to wait for the rolling ball to come to a complete stop before you can continue - for no good reason at all. The option to use X's and O's instead of animated players is ridiculous. 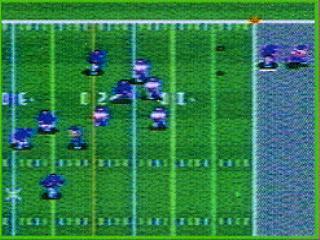 NFL Quarterback Club is a playable game, but there's got to be better football action available for the Game Gear. © Copyright 2003 The Video Game Critic. Wow, this is terrible! NHL All-Star Hockey blows enormous chunks, and after playing it, I suspect you will too! The players are reasonable in size and the rink looks fine, but the animation is atrocious. The players tend to jump around and the screen scrolls in a jerky manner. In terms of graphic quality, this game has more break-up than a Vince Vaughn movie! It's hard to determine who you're controlling, and the puck tends to get lost in the muddled mess. Your player is highlighted with a white box around his number. As you can imagine, that does not stand out very well against the ice! The passing controls are erratic. Your teammates tend to stand around like idiots, and they enter the attack zone way too late to execute one-timers. What are they doing?! Shots on the goal are weak, and when the puck does find its way into the net, you'll have absolutely no idea how it happened (sorry, there's no replay). You can never get any sort of angle on the goalie, who might as well be a brick wall. The excessive difficulty just adds insult to injury. On defense, the controls for switching to the closest man are deplorable! NHL All-Star Hockey is chock full of glitches including players that continue to advance the puck up the ice even as they are lying flat on their backs! I found it difficult to believe that Sega could produce such a bad hockey game, until somebody reminded me about NHL All-Star Hockey for the Sega Saturn. Ouch! © Copyright 2010 The Video Game Critic. I thought I'd love this one, considering how crazy I am about the old Genesis PGA games. But this wasn't made by Electronic Arts, and it shows. While initially perusing the options menu, I noticed you could turn off displays like the overhead view, ball lie, green close-up, and others. I couldn't understand why anyone would want to turn these off, since they all play a part in the strategy of the game. Then I started playing and realized just how freakin' slow this game is. You're constantly hitting the Start button to pass through all the aggravating set-up screens, and once you finally get an opportunity to swing, you can't even tell where you're aiming. The sparse scenery doesn't help much, and neither does the useless overhead map. One thing the game does do right is employ a standard, 3-button-press swing meter that's easy to use. Unfortunately, once the ball is hit, you have to wait several seconds for the new spot and surrounding scenery to be rendered slowly on the screen. This game will test the patience of most gamers. A few seconds here and there really add up over eighteen holes. PGA Tour Golf is a pretty weak golf game that you won't want to play unless you have a lot of time on your hands. © Copyright 2003 The Video Game Critic. 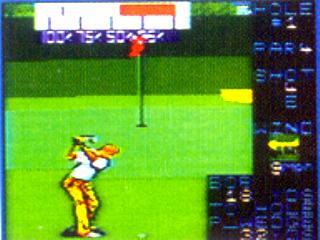 This is golf done right on the Game Gear. Like the Genesis PGA Golf games, this one features a streamlined interface, tight controls, a wealth of options, and realistic gameplay. Play modes include practice, tournament, or skins, and up to four people can play (taking turns). After viewing an overhead preview of each hole, you are taken to the main screen that provides all the information you need to make an informed shot. Unfortunately, rendering the scenery on this screen can take up to 10 seconds, which dramatically slows down the action. The swing meter is a pleasure to use, and you can adjust your draw or fade before the shot. You can't add topspin or backspin, but you can select "punch" or "chip" shots. When on the green, a detailed "grid" appears to help you line up the shot. There are six courses to choose from, and a generous options menu lets you fully tailor the presentation of the game. There's even a password save feature. PGA Tour Golf II is a terrific golf game, and if not for the pauses in the action, it would be 'A' material. © Copyright 2003 The Video Game Critic. What's better on a portable system than a quirky, upbeat arcade game? Pengo has all the necessary ingredients: bright graphics, cute characters, catchy music, and simple gameplay. There are even intermissions! Pengo wasn't exactly a runaway hit at the arcade but it's got a really cool concept. You control an orange penguin (wait what?) navigating a maze of ice, sliding blocks into blob-like enemies to clear each stage. The satisfaction you get from crushing a blob is comparable to dropping rocks on pookas in Dig Dug (Atari 5200, 1983). Feels so good! You need to act fast to hit an enemy crossing your path, but the controls don't do you any favors. They feel so... slippery. Okay, I know - it's an ice game - but work with me here. Half the time instead of pushing a block you accidentally slide around it instead, placing yourself in harm's way. Still, Pengo's pure simplicity makes the game addictive. The harmonized music is catchy and the dancing penguin intermissions are funny. I don't normally do the "import thing" with my Game Gear, but titles like this are worth it. Note: Game Gear cartridges are region-free. © Copyright 2016 The Video Game Critic. Primal Rage made some noise in 1994 with its awesome premise. What could be better than dinosaurs and giant apes fighting to the death in a post-apocalyptic world?! It never really lived up to the hype, but you can still enjoy the pure spectacle of it. Having played all the console versions, I tempered my expectations quite a bit for this miniature Primal Rage. That said, it looks astonishingly good! The backgrounds are a little sparse, but the creatures look impressive as hell! Not only do they sport that distinctive "claymation" appearance, but they are freakin' huge in proportion to the screen size. The animation drops a few frames here and there, but the game is certainly playable. The controls are severely limited by the two-button configuration (the arcade used four), but it's still possible to pull off special moves (like spewing vomit) by hitting both buttons at once. There are no human spectators, but that's no big loss. The sound effects are sparse aside from the relentless jungle beats. One issue is how your score isn't displayed on the screen - or even between rounds. In fact, you'll never even see a score unless you break into the top three. This portable translation of Primal Rage is nice on a technical level but don't expect much in the way of replay value. © Copyright 2014 The Video Game Critic. Based on a TV show This game is funny! I wasn't expecting much from Quest for the Shaven Yak Starring Ren and Stimpy. I love the TV show but its video game adaptations don't have a great track record. This game however is a pleasant surprise. It infuses the irreverent, nonsensical humor of the cartoon into a well-rounded platformer. The characters are detailed enough to convey all the wacky animations and dramatic facial expressions they are known for. I love it when Ren's eyes bug out or when Stimpy gives that bashful look. The stage designs are predictable as you forge through places like the "Blacker-than-Black Forest" and the "Stinking Hot Desert". You move slowly but can jump high. You'll toss toothbrushes and hairballs to turn away skunks, lizards, woodpeckers, and vultures that drop white poop. Certain enemies are seriously annoying, like those quill-shooting porcupines. As for special abilities, Ren has a super jump and Stimpy has a ground pound which can break small branches. Weapons and power-ups come in the form of toast, soap, shaving scum, and a remote control. In advanced stages you'll contend with a few cheap hits like roving stormclouds and creatures obscured by rocks. Still, you can detect and avoid most hazards (like falling stalactites) by moving cautiously. It helps that you get a lot of lives. Ren and Stimpy have three each, and you can switch characters between stages. I like how your score is tallied after each stage, and the game has a slick password feature. Quest for the Shaven Yak doesn't try too hard but much like the cartoon, it has a quirky, easy-going style that proves endearing. © Copyright 2017 The Video Game Critic. With its brisk gameplay, simple controls and detailed players, RBI is a good choice for Game Gear baseball fans. Perhaps most impressive is how similar this game is to the Genesis version, both in terms of graphics and gameplay. The pitching/batting interface is simple as can be, and chasing down balls in the field is actually enjoyable. The players are exceptionally large for a portable game, although their animation looks somewhat robotic. I do hate how fielders always catch the ball while reaching straight up and standing on their toes! It looks idiotic; especially when a throw comes in low. I suspect this may be a bug in the code. RBI features its trademark instant replay feature and a pleasant melody plays throughout the game (no, you can't turn it off). The game moves along at a steady clip, but like the Genesis version, an excessive number of foul balls tend to slow down the action. 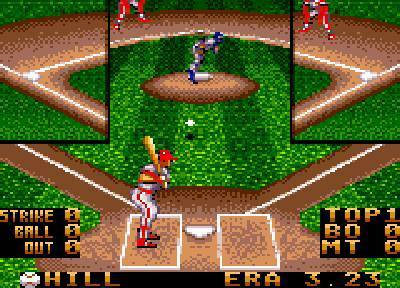 Otherwise, RBI Baseball 94 delivers an addictive, arcade-style flavor of the national pastime. © Copyright 2005 The Video Game Critic.